Tapping into stimulus-enhanced Small Business Administration loans, some seller financing and city urban renewal funds, Oregon Coast entrepreneurs Chris Nemlowill and Jack Harris have added "real estate developers" to their microbrewer calling cards. The pair are proprietors of Fort George Brewery & Public House, a popular and growing three-year old microbrewery and restaurant in blue collar (and economically struggling) Astoria, Ore. Last fall they also became the owners of the approximately 12,000-square-foot structure housing their operation and neighboring bakery - and the 30,000-square-foot building next door into which they're aggressively expanding. Nemlowill and Harris now control pretty much an entire block near Astoria's downtown core, a couple blocks from the Columbia River near its dizzyingly wide mouth. The transactions with former landlord Robert Stricklin even give them a parking lot just across Duane Street. Given their ambitious plans for the 1920s-vintage buildings - both of which sat empty for many years before the bakery and pub opened in 2007 - the parking lot will see plenty of activity. The partners and various crews are busy improving the real estate to house considerable expansions of both the restaurant/pub and brewing operations. 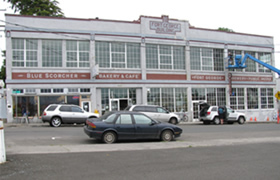 At the Fort George building now housing the pub and Blue Scorcher Bakery on the ground floor, the restaurant operations will grow upward into a spacious second-story loft featuring event space (and an outdoor deck), and also outward onto a new street-level beer garden between the buildings. The block is part of the original site of the historic Fort George, one of the Pacific Northwest's earliest sizable structures following the Lewis & Clark expedition. Both levels of the Fort George building - which had been used as a service station and body shop - feature massive Douglas Fir ceiling beams, providing striking local-color ambiance. Crews also exposed similar beams next door at the so-called Lovell building, which in previous iterations had served as a Chevrolet auto dealership and showroom, and even a theater. Much of its upper floor will be devoted to Fort George's barrel-aging facility and primary storage area. A local glass-blowing operation is setting up shop on a portion of the floor, and Nemlowill and Harris will look to lease additional space there to other artisan types. The downstairs space, formerly home to an auto repair operation, will house the microbrewery's much-expanded production facilities, along with canning line and cold storage. The brewing expansion is slated to boost output by about a factor of five, to 180 barrels on a weekly basis. In a state renowned for its microbrews, Fort George has become popular brewing small batches of artisanal beers, which change seasonally. It sells to pubs and restaurants across the state, and the owners expect their footprint to grow considerably as production ramps up with the expanded capacity in coming months. As for the various financings, the partners tapped a $650,000 SBA 504 loan to acquire the Fort George building. Thanks in part to recent temporary enhancements of the 504 program, the SBA loan's blended interest rate comes to roughly 5.5 percent. With a 504 loan, business owners contribute 10 percent equity (and personally guarantee all the debt); the SBA guarantees in full a 40 percent debt tranche funded through a specialty Certified Development Co.; and a participating private lender funds the senior real estate secured "companion" loan comprising 50 percent of capitalization. As part of federal economic stimulus efforts, the SBA is temporarily also guaranteeing up to 80 percent of the companion piece as those loans are sold into the secondary market. Evergreen Business Capital is the CDC behind the Ft. George 504 loan, with Bank of Astoria providing the 50 percent companion tranche. The SBA also temporarily waived companion lender fees and CDC processing fees. Nemlowill estimates the waivers saved him and Harris some $20,000 in closing costs. Seller Stricklin, a long-time local developer, is also carrying a note on the Lovell building, the principal amount of which the partners want to keep confidential. The entrepreneurs paid a total of $1.65 million for real estate including the two buildings, a small parking lot between them, and the former rental car parking lot across the street. A second SBA loan (the partners likewise declined to specify the amount), from a non-profit Certified Development Financial Institution called ShoreBank Enterprise Cascadia, is funding the many improvements Nemlowill and Harris are making to their operation. And the Astoria Development Commission just approved a $30,000 grant and a loan of $122,000 from urban renewal funds to help pay for exterior repairs and painting and other activities.